“That’s okay. I can just walk to the factory from here.” I turned away, but not quickly enough. Si jumped in front of me like a rabbit. Vietnam’s largest island, Phu Quoc, was only thirty miles southwest of the mainland, but a world away in terms of the hustle and bustle of city life. Gone were the jam-packed streets of Ho Chi Minh City. Gone were the car horns. The rush of everyday life was replaced by dirt-strewn bumpy roads, jungle forests and long stretches of undeveloped beach with bungalows made of bamboo and palm scattered along them. The azure ocean curled around the island, rhythmically tossing its waves against the shore. Palm trees along the shoreline stuck out at crazy angles. 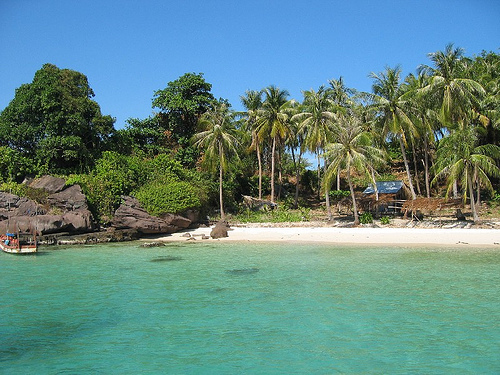 My dislike of the touristy and love of the obscure found me seeking solitude on Phu Quoc island. After the crazy chaos of Hanoi and Ho Chi Mihn City (eighty-two million people can be overwhelming at times), I wanted to read books on the beach, collect my thoughts, and dine on fresh fish. The one activity I planned was to visit the island’s fish sauce factory, where the world’s greatest fish sauce was made. Time on Phu Quoc would give me a chance to discover the source of the ubiquitous flavor I had tasted all over the country, in every dish, in all the foods. Fish sauce is to Vietnamese food what soy is to Chinese–the seasoning and the universal flavor of the nation’s cuisine. It replaces much of the body’s needed salt content after sweating all day under the hot sun in the tropical humidity. To stir-fried vegetables it lends a salty flavor. To pork that has been marinated in it and baked in clay pots, it produces a caramelized sweet flavor. Salad rolls are dipped in sauces called nuoc cham, made of fish sauce, lime juice, sugar, garlic and chilies. It is present in pho, a clear beef broth soup filled with rice noodles, green onions, basil, cilantro, mint, and bean sprouts, spiked with ginger and garlic. Fish are stewed in a curry sauce of coconut, chilies, cilantro, and lime leaves, and finished with fish sauce. 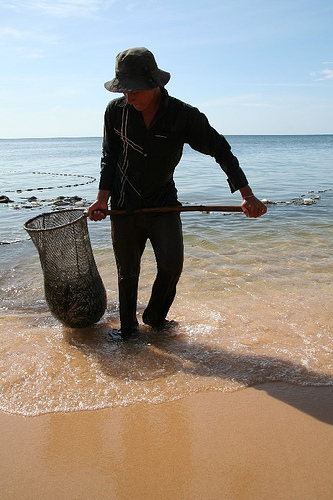 Kim Hoa is the fish sauce produced on Phu Quoc. Every afternoon at three o’clock, the fishing boats leave the island for the Gulf of Thailand. 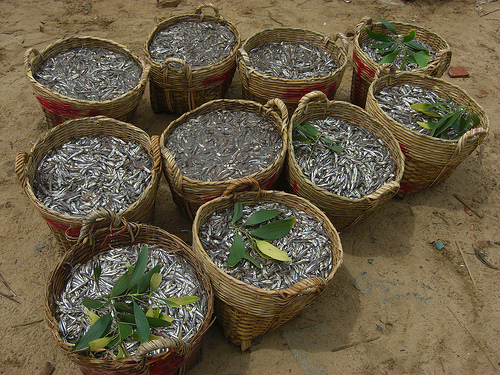 A night’s fishing brings in the small silver anchovies (ca com) that are used for this particular brand. The next morning, fish brought in by the boats are rinsed and laid to dry in the sun. The anchovies are then layered in gigantic island hardwood vats, seasoned with salt from the surrounding sea, and left to ferment for a year before bottling. The liquid that oozes from the fish is filtered and aged in other wooden vats until it becomes light brown and fully flavored. Like the best olive oils of the world, the first ferment and pressing is of the highest quality and is used in the dipping sauces. But in order to increase profits, the fish are fermented and pressed a second time for a lesser grade of fish sauce that is generally used in cooking. Si brought me to the factory, but he wouldn’t go through the gates. He was the only tour guide on the island, but his cargo shorts, flip-flops, and bare chest made me question his validity. Wouldn’t a tour guide want to show me around? Instead, he stayed with the motorcycle, smoking cigarettes with a group of boys from the boats and making plans for the night. I explored on my own. The place appeared normal enough. Like any fish factory, the large warehouse sat next to the water with a rickety dock leading down to the fishing boats. Abandoned crates in a state of disrepair and piles of discarded nets were scattered in the yard. As I entered the factory, the smell hit me like a door being slammed in my face. It took my breath away. I now understood why Si didn’t bring tourists here. This was no ordinary place. The look of the factory and the operation were all what one would expect, but the smell was another thing. There was no nice way to put it. This was stinky rotting fish. Wooden vats, with spigots on the bottom to pour off the liquid, lined the warehouse walls. These weren’t the small kegs often used in winemaking; these were much larger and shaped like round flowerpots. Each vat held twelve tons of anchovies. The cool, dark room also held a bottling conveyor belt for production, just like a winery. Stacked in the corner were cases of the finished product. This particular factory produced six million liters of fish sauce a year. “You taste?” A factory worker held out a bottle for me to try. On an overturned vat sat a plate of salad rolls. She nodded and smiled, pouring a small amount of brown liquid into a bowl. I held it up to my nose to smell, then dipped my pinky into the dish and raised it to my lips. Fermenting, rotten fish squeezed to extract an aromatic liquid doesn’t sound appealing, but it tastes delicious. It is the essence of Vietnam. It adorns every table, alongside plates of fresh herbs, lime or kumquat wedges, sliced red chilies, and a mixture of salt and pepper. People are expected to adjust each dish with these condiments, balancing flavors with a squeeze of citrus, a few more herbs, or a dash of fish sauce to suit the individual taste. I devoured the roll in three bites. Perfectly balanced flavors of salty, sweet fish sauce hit my palate, filling my mouth with an explosion of taste. It punctuated my senses. This wasn’t the overpowering concoction I bought in grocery stores in the West. The Thai fish sauce I bought at home tends to be very strong and pungent, but this liquid was smooth and intoxicating. The flavor was lighter and fresher than any other fish sauce I’d tasted. It had the transparency of malt vinegar and was the color of amber. “Delicious,” I said. “Can I buy a bottle?” I wanted to make a gift of this find. The woman laughed. “No can take on airplane.” Flight regulations deemed that this delicious elixir was toxic. Special flights and shipping procedures had to be followed to export the sauce. This particular food item would have to be a memory only. It didn’t hurt that the swordfish I ate that night was the same one I watched fishermen pull out of the Gulf of Thailand late that afternoon. I poured a generous amount of Kim Hoa fish sauce over my water spinach that had been sautÃ©ed in garlic. Stinky rotten fish never tasted so good. Victoria Allman has been following her stomach around the globe for eleven years as a yacht chef.Â She writes about her floating culinary odyssey through Europe, the Caribbean, Nepal, Vietnam, Africa and the South Pacific in her first book, Sea Fare:Â A Chef’s Journey Across the Ocean, available at www.amazon.com. Her latest literary adventure sees Victoria contributing her tales of wandering the globe in search of new food to Tales of Breaking Free and Breaking Bread Around the World, a collection of Female Nomadic stories, edited by Rita Golden Gelman, Random House summer 2010. You can read more of her food-driven escapades through her web-site, www.victoriaallman.com.